1. During your pregnancy and birth what new skills/aspects about yourself have you learnt? I’m proud of taking a proactive approach to preparing for my second son’s birth. 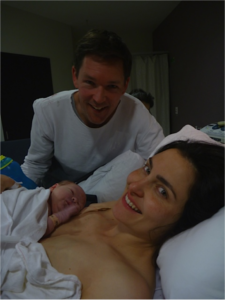 Knowing I wanted to have a natural birth after having a c-section, I felt as though I needed to arm myself with a wide range of tools to better my chances of having a VBAC. Asking Erika to be my doula was a key part of my readiness and preparation. 3. Is there anything you would like to do differently next time you are pregnant / give birth / parent? If I gave birth again, I would like to take more time to consider alternatives to what is being suggested by the hospital. Although I was happy with what occurred during the birth, I felt as though I agreed to procedures in the moment, which perhaps weren’t immediately necessary (such as A.R.M), without considering alternatives. There was significant pressure from the doctors to adhere to hospital timeframes for a VBAC. I would also like to prepare better for the second stage. For this birth, I was focused solely on the position of the baby and reaching 10cm dilation because that is where the complication arose during my last birth. I didn’t give enough consideration to what I was going to do, or what I did or didn’t want to occur, during second stage. 4. What were the benefits in having doula support? I truly believe I wouldn’t have had a VBAC if it wasn’t for the support and confidence provided by Erika at my birth. While my husband gave me important emotional support, Erika gave me confidence in my ability to birth naturally and offered me vital support and comfort throughout (e.g on the phone at home, focusing words during labor, positions for pushing). She helped me stay committed even in the most difficult point during transition when I feared the same obstacle would arise as last time. 5. Is there anything I would like my doula to offer, or do differently, that may improve her support for me, or others? 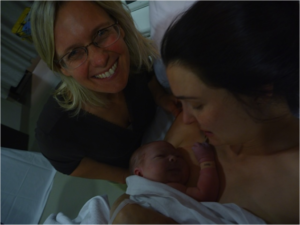 For women wanting a VBAC who didn’t reach second stage, I would recommend more of a focus on that aspect of birthing – when to push, how to push, what can occur in terms of delivery methods/ timeframes, episiotomy versus no episiotomy etc.